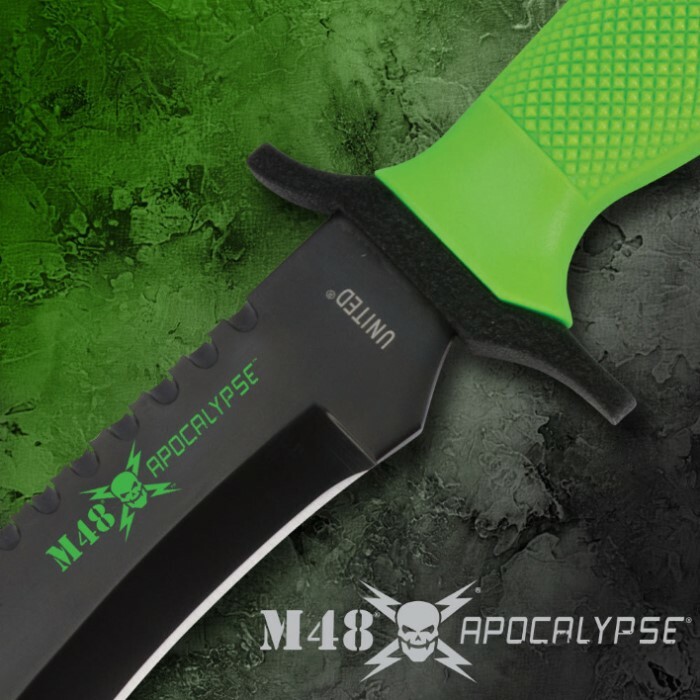 Introducing the post-apocalyptic Zombie Survival edition of our Special Forces Bowie. This is a survival bowie knife that you can count on. At 12 in. overall with a checkered ABS grip, it's perfect for hip carry while on the move, and is capable of taking on large cutting tasks. The 7 in. AUS-6 stainless steel blade comes coated with a non-reflective black finish. Other blade features include the well defined bowie point, a weighted front, and serrated "sawback" edge for tougher targets. Includes a hard ABS sheath with belt loop, handle security strap, and lashing slots. Neon green apocalypse accents complete this piece. 7 in. blade, 12 in. overall. When I received this knife I was happily surprised by its large size and sturdy build. I tend to be one to lend out things.....but not this one! I received two of these knives as a BOGO. To be honest, for $9.98 and the fact that they are not full tang, I wasn't expecting much. However, I am pleasantly surprised by these knives. They feel very solid, heavy and came razor sharp. The sheath is pretty decent as well. I had mixed feelings about the Zombie green color, but since that doesn't affect function I ordered anyway. But now that I've seen it in person the color has grown on me and I kinda like it. The only "con" for me so far (besides not being full tang) is the tip of the knife. In the photo the knife has a very sharp point. On the two I received, the tips are rather blunt. The weren't broken off, its just the way the blade was ground and sharpened by the factory. Still for $10, and knowing beforehand that they aren't full tang, I won't knock any stars off. I got two of these during the bogo sale and got one engraved with my initials. Very nice to look at. They didn't come very sharp or pointed but that can be easily fixed with the sharpening tool I bought a few months ago. Very cool bowies. It is excellent. Good loking, strong, easy to carry and store, comfortable. Great price, well built my friends loved it! This is a must have for all who love a good knife. 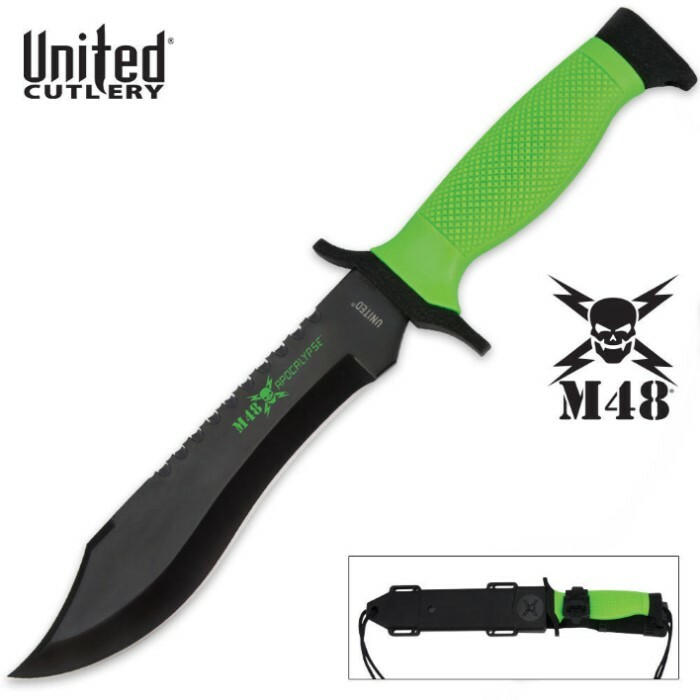 I have been wanting this knife for a while now but the price was not to much at first because if I didn't like I would be stuck with it....But M48 says it all....I love this thing. This knife is excellent for the price it is very sturdy. The sheath is also great quality. There was only one problem for me, it did not come razor sharp. But that is an easy fix. Other than that zombies... beware!! !